Join us as we honor the life and work of jazz clarinetist Buddy DeFranco, who passed away on Thursday, December 24th at the age of 91. We will preempt regular jazz programming from 5:00am on Thursday until 9:00pm Friday evening. 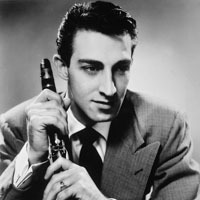 At 14, DeFranco won a national swing contest sponsored by Tommy Dorsey and went on to work with the big bands of Tommy Dorsey, Gene Krupa, and Charlie Barnet. After working briefly with Count Basie’s septet in 1950, DeFranco began his career as a bandleader. In the decline of swing and big bands, DeFranco was one of few clarinetists to successfully translate the instrument from swing to bop. He went on to become an innovative bandleader, working with musicians like Art Blakey, Kenny Drew, Sonny Clark, Tal Farlow, Oscar Peterson, and Tommy Gumina, as well as leading the Glenn Miller Orchestra from 1966 to 1974. DeFranco, a member of the American Jazz Hall of Fame, co-led a quintet with Terry Gibbs since the early 1980’s and recorded and toured throughout his life. DeFranco was a creative player and an impressive influence on following generations. Tune in as we recognize his remarkable career.